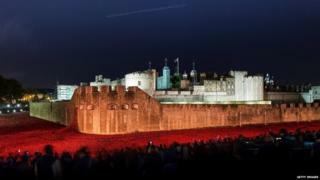 Parts of the huge ceramic poppy display at the Tower of London are now going to be staying until the end of November. Parts of the huge ceramic poppy display at the Tower of London are going to stay on show until the end of November, Prime Minister David Cameron has said. 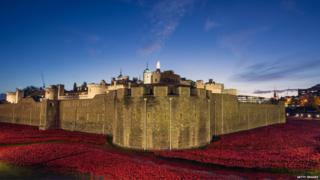 The poppies have been gradually 'planted' in the Tower of London's moat since July. The original plan was for all the poppies to be removed after Remembrance Day (11 November). 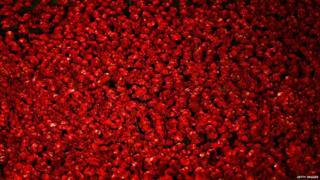 The installation is called Blood Swept Lands and Seas of Red. It marks 100 years since the start of World War One. There will be 888,246 ceramic poppies 'planted' by Remembrance Day - one poppy for each British and Commonwealth death during the war. Most of the poppies have been sold to raise money to help former servicemen and women. 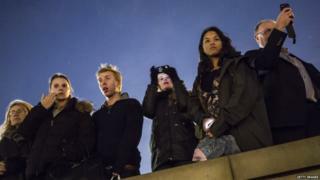 Some will go on a tour around the UK, so that more people can catch a glimpse of them. 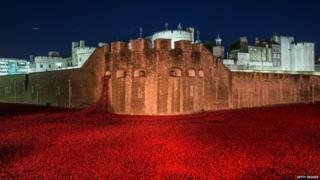 It's been so popular that there has been a campaign to keep the poppies there for longer. The artwork has drawn massive crowds. 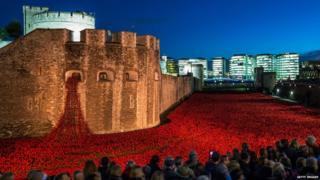 It's thought that up to four million people will have visited the attraction by Remembrance Day on Tuesday.